130-135 mph (217 kph) possible this year! With a world of possibilities in future, but we would have to poach a run in from the wilderness area to get more than 2500 vertical. 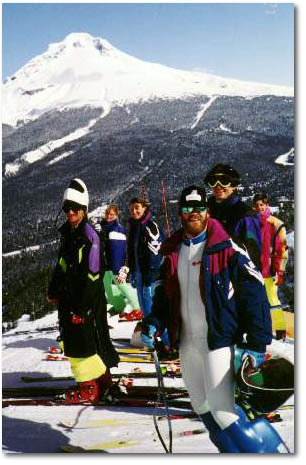 If you want some of the old days back where speed skiing was a sport of friends trying to overcome their fear, and push the limits in a fun venue, then come to Timberline Lodge on Mt. Hood during the first week of May 2000. This is a truly fun relaxed race. You can get your speed fix and have fun while doing it. Just the chance to set a US record and for some of you, personal bests. 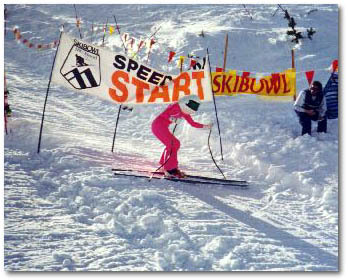 On Snow Speed Event for: Speed Skiers, Snowboarders, Alpine Skiers, Telemark Skiers, Mountain Bikers (anyone crazy enough to want to go fast, general public welcome - bring a helmet). This Slide Fest is the 2nd speed event to be held at Timberline Ski Area on Mt. Hood, Oregon. Our first 1999 Slide Fest went over great. Open to all comers in any discipline. Course will be a maximum of 1500 vertical feet with the finish area at 7000 ft. elevation. The piste is accessed by 2 high speed quads, The Magic Mile, and The Palmer Lift. The historic Silcox Hut will be the sight of the race headquarters located at junction of the two chair lifts at 7000 ft. Registration - begins at 7:00 a.m. each day at the Silcox Hut. Lift tickets will be provided by the Timberline Ski Area at the normal race discount. Race Volunteers included competitors who help with the race will be given a lift ticket for the day and a voucher for another day.